The University of Toronto is a public research university that has 11 different colleges. Each of these colleges has a completely different history and environment. This university is highly acclaimed for its impact on the field of research and has played a critical role in some of the most high-quality academic works. In the beginning, the University of Toronto was controlled by the Church of England as Canada used to be a British colony and followed the same system as some of the most prestigious universities in the UK. The University of Toronto is accredited for spearheading a number of significant achievements, including the launching of Canada’s first academic publishing house. The University of Toronto’s campus includes a number of historic buildings and courtyards that are in league with the finest universities of Europe. 10 Nobel laureates have been affiliated with this university. McGill University is ranked as one of the most prestigious universities in Canada. It attracts a large number of international students from all over the world every year. 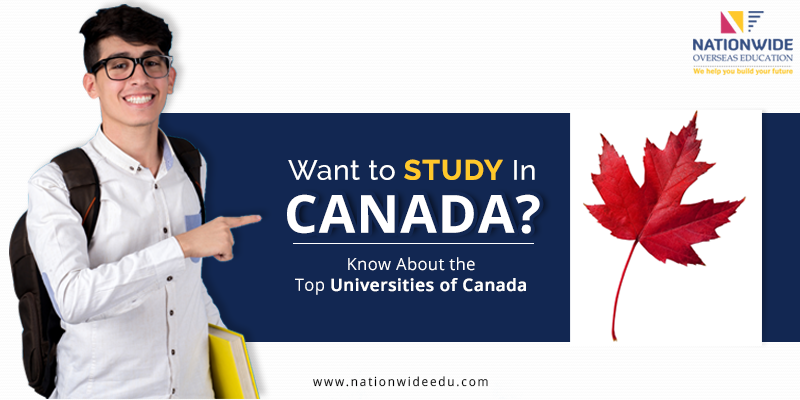 According to student visa consultants for Canada, McGill University is a favorite among candidates from India. Located in Montreal, McGill University was founded in 1821 at the base of Mount Royal. Esteemed singer-songwriter Leonard Cohen and the famous actor William Shatner have graduated from this university. McGill University is the only Canadian university that is a part of the World Economic Forum’s Global University Leaders Forum. This forum comprises of the heads of twenty-six of the globe’s top educational institutions. With around 50 in-campus research centers, McGill University has the highest percentage of Ph.D. students compared to any other research university in Canada. The university has been promoting a global outlook and continuously recruits international students and faculty. The university also encourages international collaborations with other renowned institutions from all over the world.